It's November 1, which means this is the first day of National Novel-Writing Month. It's also the first day of several other specialized months I don't recall, and to tell the truth, the idea that someone could write a novel in a month is a bit preposterous, unless you clarify that the aesthetic standard is not the best novels ever written or even the vast tide of mediocres churned out but the lowest common denominator, which very well could be penned in one month. That is to say, the novel need not be 1) complete, 2) more than a first draft, 3) very good, 4) good, 5) even mediocre, and 6) a novel. I keep reading "50,000" words or "175" pages bandied about as if the length of a work of prose fiction alone determines the genre, but it might be fair to say that at 50,000 words you no longer have even a long, long short story ("The Dead") or a novella ("Seize the Day"), even if what results isn't really, well, a novel. I guess someone'll have to think up a name based solely on length. At any rate, the idea is an interesting and provocative one. At the university we ask our upper-level undergraduates to write a novella in about 5 months (1/2 the winter quarter and all of the spring one), which leads to great anxiety, many lost nights for the professor and students, and some wonderful pieces by the end of the year (or at least good starts), and certainly it's possible to write a novel in less time than it took James Joyce with Ulysses (yet again another of the greatest novels in the English language, requiring 17 years, which show in every line), but...one month! Well--let's say a first draft or much of a draft. That I can see. Maybe I'll try it. If anyone is game, keep J's Theater posted. And get cracking! PS: Maybe a quick, painless November-written novel to go along with the right Jimmy Choo shoes, closet full of spring 2007 Prada suits, new Mercedes SUV, and McMansion in that gated community in the ex-ex-urbs! The commodity society wins out every time! When I was in college, I went through a mild literary obsession with Wole Soyinka (at left, tonight, cellphone pic). I'd happened upon Chinua Achebe's Things Fall Apart (which many universities and even high schools now teach, though I wasn't so fortunate to get that kind of institutionalized introduction), and the poetry of Christopher Okigbo (who died in the Biafran War and whose poetry seemed so elusive and exquisite and hopeful and tragic that I wanted to mimic it), and that jumpstarted an interest in anything written by anyone from Nigeria. In those pre-Google days, I went and searched the library shelves and card catalogues, and one of the first names that popped up was Wole Soyinka. I am trying to remember what of his I read first; I think it was the poems in A Shuttle in the Crypt, because I concretely recall thinking about them (elusive and exquisite and not very hopeful but not tragic either) when he was named the 1986 Nobel Laureate. He had written them during his imprisonment during the Biafran War, and yet again, I wanted to mimic them but realized fairly quickly that I lacked not only his linguistic gifts but the context in which they were written. 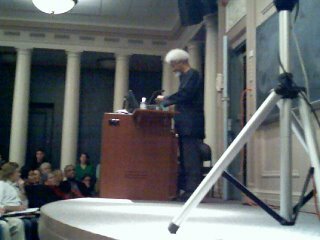 After he received the Nobel Prize, many of his books went into print, and I ended up reading most of the poetry I could get my hands on, his novel The Interpreters, and many of his nonfiction books, like the memoir Aké and his study of African mythology and its relation to African societies. I didn't read any of his plays until sometime later (the mid 1990s), but the spell cast by those poems (which interestingly enough my former classmate and old friend Ngozi Ola's work was deeply in dialogue with) has never fully subsided. I had the opportunity to use some of his theorizations of myth in the first literature class I taught, and I periodically dip into his poetry for inspiration and to remind myself of what I have considered to be a standard. As part of this fall's One Book One University program, which is focusing on Shakespeare's Othello, Soyinka gave a talk on "Othello's Dominion, the Immigrant's Domain," this evening. I got to speak with him briefly before his peroration, which drew a line from Othello's strange status in Venice through to the United States's protestations of its dis-ease in the world and its ongoing cry of why does the rest of the world dislike us so, touching upon a range of issues, including his own immigration in the 1950s to Britain to study at Oxford and his status as one of the "Princes of Exotica," which changed several years later as waves ("boatloads") of Caribbean immigrants arrived to work in the United Kingdom's factories and rebuild its economy. I saw him calling into question the simple reading of Othello as an assimilationist who ends up being duped; he wanted to show how cut off, isolated, family-less and denatured, defamiliarized, that is, Othello was, and how the violence he enacted were not crimes as we know them, but operating in contexts that are unknown to us today and yet, as in the case of honor crimes across the globe, and the radical alienation of the self resulting in murder and suicide, horrifyingly comprehensible. At least that's what I think I heard, but my immediate thought at the end was that the talk was inspired and enlightening, and that I wanted to read it slowly to grasp all that was in it. Part of the time I was marveling at his sheer performance of the self--his white picked-out afro and goattee, his trim profile, his immaculate buba, his rich, resonant voice. Given the technical glitches preceding the event, I doubt that it was captured on tape and I didn't bring my trusty DAT recorder, but perhaps someone else did record it, and they'll put this and the other Othello events, including a discussion of Tayeb Salih's Season of Migration to the North, featuring three colleagues, Nasrin Qader, Christine Froula and Evan Mwangi, that I introduced the other night, in book or audio form. The media is in a state of total testeria about John Kerry's gaffe (at least so say the blogs), but then again, he was the (lackluster) Democratic presidential candidate in 2004, he always knows how to put his patrician foot in his platinum shovel-shaped mouth, and the Republican echo-braying machine has gotten whipped up into yet another lather of sanctimony, so of course the mainstream media follow along like the dazed sheeple they are. But here are five questions I'd like one of these media bobbleheads to ask Bush, Cheney, Rumsfeld, or any of their surrogates leading up to the elections next Tuesday. All five are very simple, and let's see if we get a straight answer, outrage, sanctimony, people whipped up into a Hitl...you get my drift. When Iraqi Prime Minister Nouri Al-Maliki ordered the US military to end its blockade of Baghdad's Sadr City, George W. Bush's compliance effectively broke longstanding military tradition and stopped the search for the Iraqi-American soldier who reportedly was abducted from the home of his bride just a week ago. Why did George Bush bow to the Iraqi Prime Minister's demands and effectively allow him to order the US military around? What is he doing about the fate of the missing/abducted US soldier, and why did he take actions that appear to have abandoned the soldier and possibly further endangered his life? Who controls the US military in Iraq, George Bush and his generals, or the Iranian-linked, Moqtada Al-Sadr controlled Iraqi Prime Minister? What exactly happened on October 11, 2006 at US Falcon Base, which Iraqi militias hit, and which proceeded to blow up all night long a few weeks ago? Initially we were told that it wasn't an insurgent attack, then it was later confirmed to be one. Were any of the 500-5,000 US troops based there injured, and if so, how many? Were any killed, and if so, how many? Why has there been a mainstream media blackout since October 12, and why aren't we getting anything more than vague assurances from the US military? Why does the US Air Force need an emergency $50 billion to "bring dead and wounded soldiers" back from Iraq and Afghanistan? $50 billion is exactly half its annual budget. Exactly how many "dead and wounded soldiers" are there, really? Didn't the Congress just appropriate an extra $18 billion to the military back in the late summer, so what exactly is going on over there? What are we not being told about where this money is going? Iraq is moving closer to being partitioned, which could spark even worse sectarian and tribal battles, as well as expand the theater of this disastrous war to surrounding states like Syria, Iran (which is already involved, as it has close ties to the Maliki government and SCIRI ruling parliamentary party), Turkey (which is basically involved, and has allegedly massed troops at the border of Iraqi Kurdistan), Saudi Arabia (which is strongly urging that there be no abrupt withdrawal for fear of partitioning and widespread violence), Kuwait, and Jordan (to which hundreds of thousands of Iraqis have already fled). What concrete steps is the US government taking to prevent the geonational and political disintegration of Iraq, and what plan do the Bush administration and the US military have in the event that the calls for regional sovereignty take hold and the country does de facto break up into discrete states? House Republican leader John Boehner (R-OH), who is also involved in the ongoing Foley-Kolbe-Page-gate scandal, made statements today suggesting that it was the troops on the ground, and not Secretary of Defense Donald Rumsfeld and his strategists, as well as the Bush White House and its administrative proxies in Iraq, who are responsible for the missteps, bumbling, and disasters that have taken place in Iraq, pushing it, as military strategists have noted, towards "chaos." Will you demand an apology from Boehner for insulting the brave women and men of the US military, and also demand that any other Republicans who insult the dignity and fortitude of the troops either apologize or resign their positions? Clifford Geertz, one of the most important, legendary figures in the field of anthropology, and a central giant in 20th century social sciences, the humanities and American intellectual life, just passed away, at 80. Here's the obituary from the Institute for Advanced Studies, in Princeton, New Jersey, where'd he conducted research (they don't exactly "teach" there) for many years. I have many thoughts on Adam Nossiter's New York Times story on some of the struggling teenagers of New Orleans, many of whom are raising themselves, but rather than take a week to comment, I'll post the link and welcome any responses. 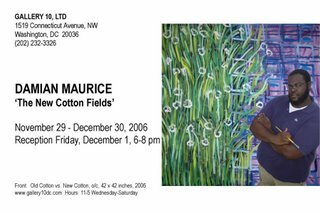 Recently I received a flyer for painter Damian Maurice Saunders' new show, which is going up soon in Washington, DC. If you're in town, it looks like it'll be a show to catch. And I'll try to get down to DC to see the Damian Maurice show.